The Blue Serpent Clock Egg is currently on view in an American museum for the first time ever. Ulla Tillander-Godenhielm, Christel Ludewig McCanless and I discussed it on email, and Dr. Tillander-Godenhielm asked for my thoughts on the Egg and its place in the chronology published in Fabergé Imperial Easter Eggs (1997) by Tatiana Fabergé, Lynette G. Proler and Valentin V. Skurlov. We both agreed that the Blue Serpent Clock Egg perhaps was dated a little too early in the egg timeline, since the Fabergé workshops probably were not ready in 1887 for such a sophisticated egg. We discussed the 1902 von Dervis exhibition (img1) in which the Egg was clearly visible in the centre of the showcase. Dr. Tillander-Godenhielm asked if I could find another plausible place in the timeline and she sent me some high resolution images of the showcases with Fabergé items belonging to the Empresses Maria and Alexandra Feodorovna. These images at first did not reveal any secrets and I searched my books about the Eggs. Slowly a pattern became visible and the von Dervis photographs helped me to get the pieces of my puzzle in the right spots. The Blue Serpent Clock Egg is the egg belonging to the Fabergé invoice of the year 1895. 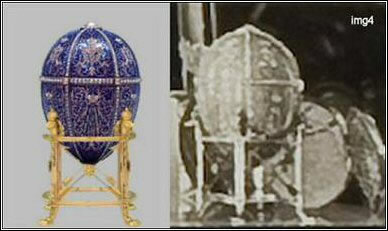 The 1895 Twelve Monogram Egg is the same egg as the missing 1896 Alexander III Portraits Egg. So, if one of the two 1895 eggs was to be a relatively simple one, it could not have been the Dowager Empress' egg; it was the egg for Tsarina Alexandra for which there was barely half a year to make it. Based on the above, I concluded the Fabergé invoice of the 1895 could be the invoice of the Blue Serpent Clock Egg. "Blue enamel egg, 6 portraits of H.I.M. Emperor Alexander III, with 10 sapphires, rose-cut diamonds and mounting, 3575 rubles"
The Twelve Monogram Egg is visible in Tsarina Maria Feodorovna's case, third shelf from the top, possibly with miniatures (img2). The Twelve Monogram Egg has six panels, divided into twelve half panels. The upper six panels are decorated with 'AIII', the monogram of Alexander III. The lower six display the monogram of the Empress, 'AF'. The couple married in 1866 and had Alexander III lived, they would have celebrated their 30th wedding anniversary in 1896. There simply seems to be no other explanation then that the Twelve Monogram Egg and the missing Alexander III Portraits Egg are one and the same egg, namely the 1896 Egg. Consequently, the place in the timeline for the 1895 Egg is available for the Blue Serpent Clock Egg. So far I found the answer to the question Dr. Tillander-Godenhielm had asked. As so often happens when questions are answered, new questions arise, and my research was no exception. The Blue Serpent Clock Egg now being the 1895 egg, there is a vacancy for an egg belonging to the year 1887. What egg could that be and what do we know about it? What happened to it? Does it still exist? Can it be found? 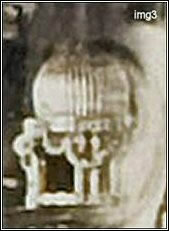 Since the showcase of the Dowager Empress is only partly visible, I can only speculate about the objects that are seen. Possibly eggs are hidden from view behind bigger objects on the lower three shelves. There is, however, an object that could be an egg on the left of the second shelf from the top. 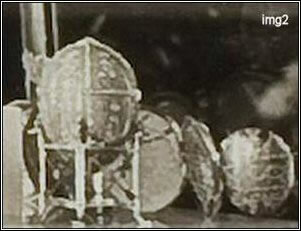 Could this "round object" be the new unknown and missing Fabergé Easter Egg (img3)? This "object" is discussed below (November 2007) by Anna and Vincent Palmade as possibly being the missing Nécessaire Egg. Soon after this was published, Kieran McCarthy of Messrs. Wartski shared an archival photograph (see below April 2008 Anniversary Edition) of the Nécessaire Egg contradicting this finding. The "Twelve Monogram Egg/missing Alexander III Portraits Egg" is seen in the von Dervis exhibition in a stand now associated with the Pelican Egg. Speculating on this find, I made a computer composition of modern photographs of the "Twelve Monogram Egg/missing Alexander III Portraits Egg" and the Pelican Egg stand. 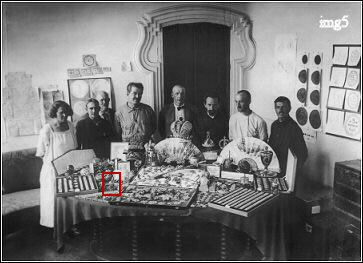 The same stand is seen again in an archival Gokhran (the Soviet Precious Metals and Gemstones Repository) photograph dated 1923 together with the Pelican Egg (img5). Is it possible that during or after the confiscation of the Imperial treasures, the stand of the "Twelve Monogram Egg/missing Alexander III Portraits Egg" and the Pelican Egg were mixed up, and have ever since then been attributed as belonging together? My thanks to Fabergé author and scholar Ulla Tillander-Godenhielm for asking this challenging question and clarifying the different Louis styles, to my Fabergé friend and art historian Timothy Adams for helping me identify the stand, and to Christel Ludewig McCanless for being my friend and never tiring "Fabergé tutor". Fabergé, Tatiana, Proler, Lynette G. and Valentin V. Skurlov. The Fabergé Imperial Easter Eggs, 1997, 240. (invoice 1094, March 31 purchase). von Habsburg, Géza, and Marina Lopato, Fabergé Imperial Jeweler, 1993, 73. Lowes and McCanless, Fabergé Eggs: A Retrospective Encyclopedia, 2001, 23 (Background Notes). von Habsburg, Géza, and Marina Lopato. Fabergé: Imperial Jeweler, 1993, 453. Ibid., 135, 242 (item 5240/1845). March 2014 - Discovery and first color pictures of the Third Imperial Egg. See Egg for more.